Lifestyle 4.2kW Propane Gas Greenhouse Heater, suitable for greenhouses up to 6m x 4m. 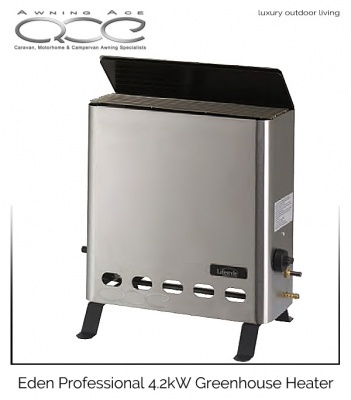 The Eden Pro Greenhouse Heater is a stainless steel heater manufactured in Europe to a very high standard. It is CE certified with Piezo ignition for reliability and easy ignition and low gas consumption. It has thermostatically controlled long lasting blue flame burners that are suitable for heating greenhouses up to 200sq.ft. The ODS (oxygen depletion system) safety valve and flame failure device are security features that ensure the gas supply is cut off if oxygen levels are too low or if the cabinet should fall over. Ideal for heating greenhouses to propagation temperatures up to 200 sq.ft. Comes complete with FREE Hose and screw on propane regulator.